Review AT&T MicroCell – No reception? Buy it. 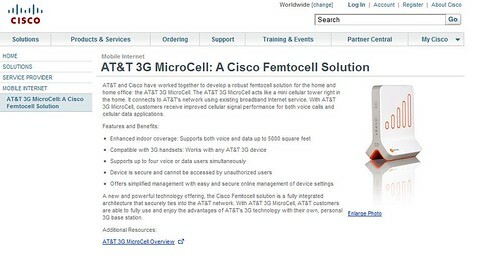 AT&T's new MicroCell device is a Cisco branded device that connects to your internet connection (DSL, Cable, etc.) and provides 3G and cell phone reception up to 5000 sq ft from the device. T-mobile attempted something similar years ago with its @home service that required you to purchase a T-mobile branded linksys router and charged $20/month to use a special wifi compatible phone. AT&T's offering appears to be a more graceful option already. AT&T's micro-cell requires that you authorize AT&T phone numbers to use the AT&T Micro-cell signal, up to 5 numbers are allowed. Once connected 3g data and phone calls will be routed over your internet service to AT&T servers. Its basically a personal cell-tower for your home or office. The device is $150.00 one-time purchase and AT&T minutes work as usual - unless you sign up for the $20/month M-cell plan. This special plan allows for unlimited domestic calling via the M-cell device. Also there is currently a $100 rebate for those that sign up for the $20/month M-cell plan. Is it worth it? Expect some drops(not as many as before ) and different call quality (not terrible, but not the same as regular AT&T cell service). In areas with poor reception this device is a must have.